Cyber criminals start distributing ransomware infections created for educational purposes sooner or later. The same has happened with CryptoDevil Ransomware. Researchers have already received reports claiming that this ransomware infection has been detected on several computers. Although at the time of writing it is not spread very actively, the situation might completely change soon, which is why we are writing about this nasty infection today. Users do not need much time to realize that a malicious application has entered their computers because they quickly notice that they cannot access some files and even programs. Just like other harmful ransomware-type threats, it targets those files users need the most, i.e. their personal photos, documents, text files, slides, etc. As has already been told, this threat can even make some favorite programs inaccessible. Luckily, it affects only the directory it has been launched from, e.g. Desktop or Program Files. In other words, not all the files stored on computer’s hard drives are locked. If CryptoDevil Ransomware has already shown up on your PC and has performed the encryption process, there is no doubt that cyber criminals seek to obtain money from you. Do not give them anything because it is possible to decrypt files for free. After reading this article, you will know how to delete this computer infection from your system too. CryptoDevil Ransomware is inside your system if you have found a red window “Ransomware Decrypter Panel” opened on your Desktop, and it is impossible to open some personal files or maybe even applications. Since this ransomware infection does not drop any ransom note, the window it opens on users’ screens works as a ransom note itself. It contains three buttons which open different kinds of information. The first one called Payment opens a message which tells users that they need to create a Bitcoin Wallet, purchase Bitcoins, and then write an email to contactcryptdevil@gmail.comt to get the Bitcoin address needed to send money. The Key Price button opens a price list. Evidently, cyber criminals want to convince users to make a payment to them as soon as possible because the price of the key for unlocking files depends on how quickly users transfer the required money. For example, if the payment is made within 10 hours, its price is $20, whereas it reaches $100 if users send money after 72 hours. The third button About opens a short description of ransomware. Luckily, there is no need to pay for the decryption key because this can be done without it. Go to enter the unlock code dm9jZWV1bWZyYWNhc3NhZG8= in the box at the bottom of the window. In case cyber criminals change this code, you can still recover files from a backup for free. Do not forget to erase ransomware from your computer first because these recovered files might be encrypted once again. We already know how CryptoDevil Ransomware works, so let’s turn to the distribution of this ransomware infection now. We should probably come clean and admit that not much is known about the dissemination of this computer infection due to the low infection rate, but still some conclusions can be made. First, there is no doubt that this malicious program enters computers illegally. Second, it is very likely that it is also distributed through spam emails like similar threats do. The malicious file which launches this infection usually pretends to be some kind of important document, so curious users open these email attachments. This is a huge mistake they make because it is enough to do that to allow CryptoDevil Ransomware to sneak onto the computer. Never open suspicious emails ever again and, on top of that, go to get a reputable tool for protecting the computer from malware and harm it can cause ASAP. 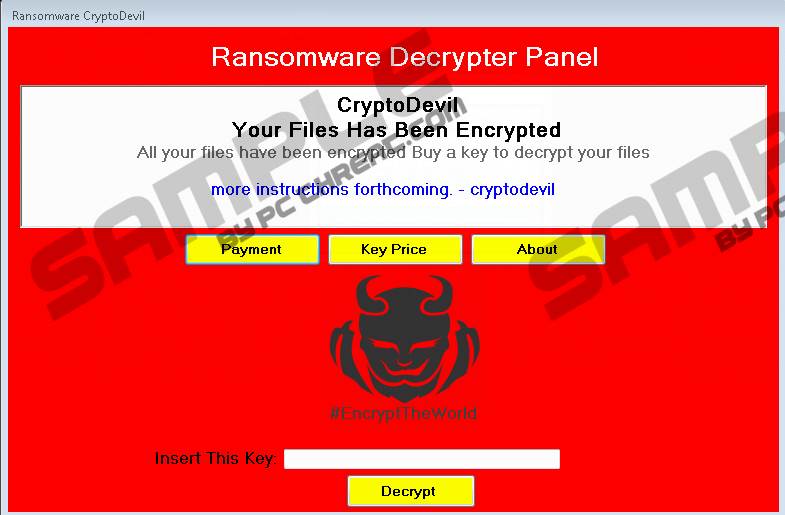 CryptoDevil Ransomware can be deleted manually and files it has locked decrypted for free. Just enter the unlock code dm9jZWV1bWZyYWNhc3NhZG8= in the box you will find on the opened window. This is only the beginning. After doing that, you must go to erase a malicious file from your computer. Use a legitimate antimalware scanner, such as SpyHunter, if our manual removal guide (it is placed below this paragraph) does not help you to find and remove it. Choose the automatic method over the manual one also if you do not consider yourself an advanced user. Press Alt+F4 simultaneously or enter the unlock code dm9jZWV1bWZyYWNhc3NhZG8= in the “Insert This key” box. Once the irritating window is closed, go to find the malicious file on your PC (check %USERPROFILE%\Desktop and %USERPROFILE%\Downloads first of all). Quick & tested solution for CryptoDevil Ransomware removal.